‘Beautiful Boy’ – based on books by father and son David and Nic Sheff – details Nic’s valiant struggle with drug addiction during his teenage years. Steve Carell plays David while Timothée Chamalet plays Nic in a film that is very emotional and a bit hard to sit through at times as it deals with the strain on the father and the damage it does to Nic in his battle to beat his addiction. Nic is in and out of rehab several times, and goes missing quite a bit, while David is struggling, emotionally, physically and financially, to deal with his oldest son’s problem while trying to raise a new family with two young children with his second wife, played Maura Tierney. Amy Ryan beautifully plays his first wife and mother to Nic. 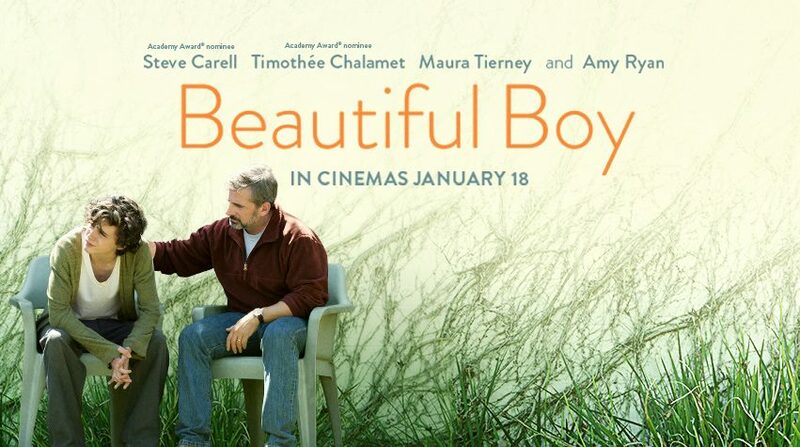 ‘Beautiful Boy’ – two hours long – is sharply directed (Felix Van Groeningen) and written (Van Groeningen and Luke Davies – ‘Lion’) with performances that are award worthy. Carell continues to excel in dramatic roles (he was superb in ‘Foxcatcher’ and memorable in ‘Battle of the Sexes’) and again is very good in this highly dramatic role. But it’s going to be Chamalet who will receive all the plaundits and awards he gets for this film. Chamalet was well-received in last year’s creepy ‘Call Me By Your Name,’ but here in ‘Beautiful Boy’ he proves that he is a force to be reckoned with. He can act, and he can act very well, and he is suited to follow in the footsteps of DiCaprio and perhaps DeNiro in a career with longevity and awards on his mantel.